Trevis is a visualization framework. You need to provide the data model. Doing so is easy. For example, assume we want to provide Trevis with a tree consisting of a root node with two children, a and b, where node b contains two children, ba and bb. In Trevis, all tree nodes have what we call a frame. That frame needs to be passed to the AbstractContextTreeNode constructor. In this example, we call the frame label, and we use a String to represent it. We could use any other type (e.g., if you use Trevis to visualize calling context trees, the frame would correspond to a stack frame, which could include a method's name, class, and signature). 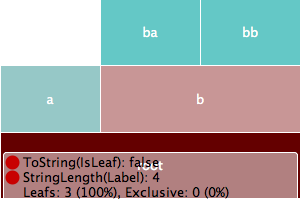 The tree class has to extend AbstractContextTree. All it is required to do is to implement the getRoot() method. We build the tree in the constructor of the Tree class, simply by creating a number of TreeNodes and adding them as children of other nodes. Now we are ready to visualize our tree. We create a Java application that opens a JFrame. We create a TreeView, place it into that frame, and connect it to the tree. The result looks as follows. The 5 rectangles represent the 5 nodes. The bottom rectangle represents the root node. 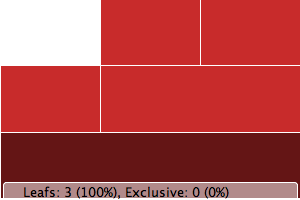 It is colored in a darker shade because the mouse was hovering over it while we took the screenshot. 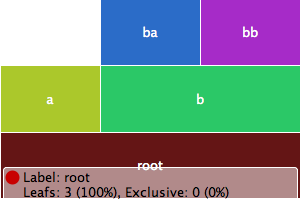 The tree grows from the bottom to the top (the left rectangle above the root corresponds to node "a"). 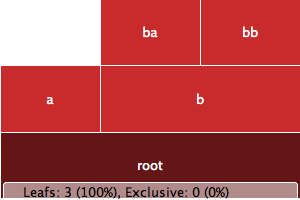 The width of a rectangle corresponds to the number of leafs in the subtree rooted at that rectangle (e.g. 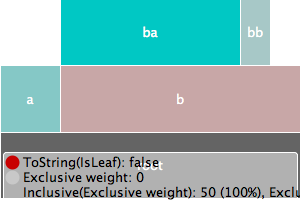 the subtree rooted in node "a" contains only one leaf, but the subtree rooted in node "b" contains two leaves, and thus "b" is twice as wide as "a"). If we would like the nodes to contain their labels, we have to configure the TreeView accordingly. But first we need an "attribute" that can extract the label (a String) from a TreeNode. Let's call that attribute a LabelAttribute. This attribute's evaluate() method extracts the label from the node by just getLabel(). The result is not very exciting, because in our simple example, each node has a different name (and thus a different color). In Trevis, attributes can have different types. 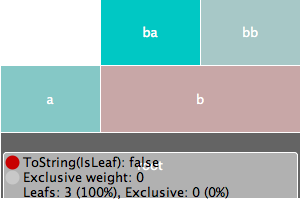 For example, Trevis provides a built-in attribute, IsLeafAttribute that returns whether a node is a leaf. That attribute is a BooleanAttribute (it returns a boolean value, true or false). The hue attribute, though, has to be a StringAttribute. Trevis provides built-in attributes to convert between types. One of these is ToString, which casts any attribute into a StringAttribute. 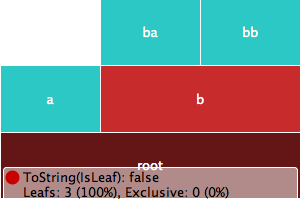 By composing ToString and IsLeafAttribute, we can now color all leaf nodes in a separate color. Trevis uses the HSB (hue, saturation, brightness) color model. In the above steps, we have defined the hue. Usually, we use the hue to differentiate between distinct categories of nodes. Trevis also provides a way to affect the saturation of a node. For that, we can call TreeView.setSaturationAttribute(), which expects a LongAttribute (an attribute returning an integral value of type long). Let's saturate a node's color proportionally to the length of its label. This way, nodes with long labels will stand out. For Trevis to be aware that there is more about the tree node than a "label", we need to provide a new attribute class, e.g. called WeightAttribute. 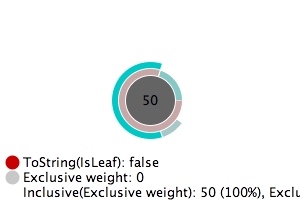 Then we can use this attribute, for example to color (saturate) the nodes by their weight. Trevis supports different kinds of tree visualizations. The linear view shown above is just one example. In order to support other kinds of visualizatons, the API comes bundled with some built-in renderers: LinearRenderer, RadialRenderer, TreeMapRenderer and HighriseRenderer. Here the root is the center of the concentric structure. The nodes are represented as ring segments. The visualization is similar to the LinearRenderer, except that the rectangles are wrapped around the circle (instead of affecting the width of a rectangle, the size attribute affects the angle of a ring segment). 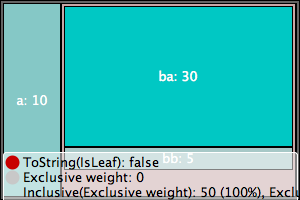 The TreeView constructor takes an array of TreeViewRenderers, thus, one can provide more than one renderer. The TreeView then provides a menu item (in its popup menu) to switch between the different renderers. Note that the first element in the array is the renderer used initially.